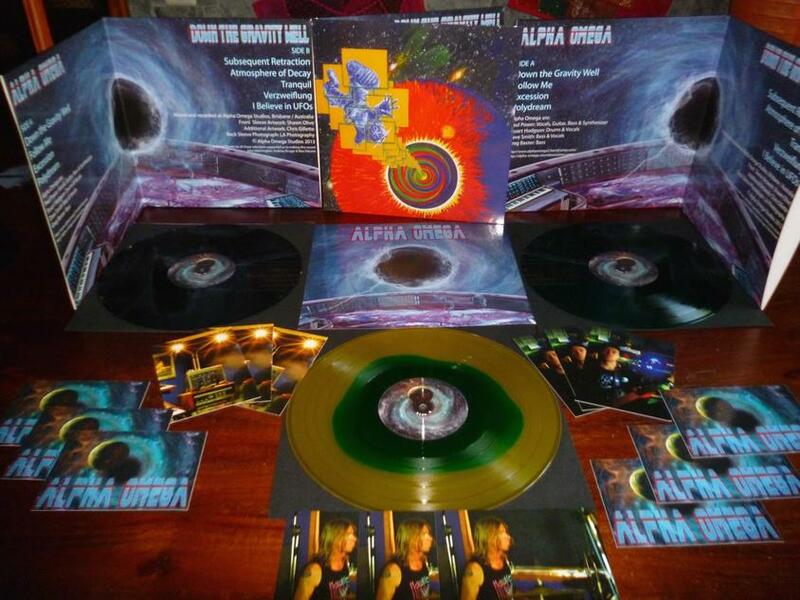 Australian space rockers Alpha Omega are back with their first full length since 2007’s The Psychedelometer (they also released a 7″ single in 2010). Down The Gravity Well is out on the German based Clostridium Records label, and comes housed in a beautiful glossy gatefold package, pressed on 180g vinyl, hand numbered, and includes poster, postcards and sticker. It’s in an edition of 500 with 200 black, 200 green, and 100 split green-yellow. It’s also available as a digital download album. Ok, the music… Side A opens with the title track, with heavy rocking guitars, cosmic alien synths, and a punky attitude in the vocals. I like the mixture of vocal sections and instrumental jam bits, which we’re treated to througout the album. Follow Me is next. After a sedate introductory bit the band launches into a punk-metal space rocker with dirty blazing rhythm guitar and a melodic lead, plus bubbling liquid psych guitar leads. The main song segment of Excession is space rock/punk-new wave similar to the way that Hawkwind’s Quarks Strangeness & Charm was, and I love the seductive keyboard melody that leads the music into deep space. Polydream goes further down this path, partly sounding like a spaced out psychedelic take on early 80s pop, yet at the same time rocking hard and I can easily hear Robert Calvert singing both these songs. In contrast to the close of Side A, the instrumental Subsequent Retraction kicks off the flip side with a blend of Space Ritual freakout and sludgy stoned bass, before settling into some serious hard rock guitar driven riffage with an alien electronic edge. Atmosphere of Decay is another instrumental, with enchanting guitar leads and brain swirling synths that hit from all directions. I like the anthem-like quality of Tranquil, which is a strumming and grooving instrumental rocker with more cool melodic guitar leads. Verzweiflung has a dark, ominous mood, rolling doomily along at a steady pace, and then rocks hard for the finale. The album closes with I Believe in UFOs, which might be my favorite song of the set and another example Alpha Omega’s penchant for heavy space rock with a punky metallic edge. In summary, Hawkwind fans and lovers of HEAVY HEAVY in their Space Rock should step right this way!